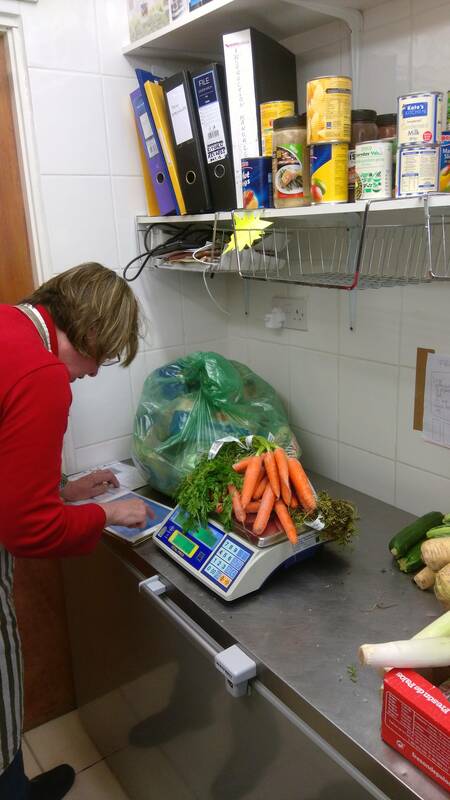 Food poverty is escalating in Wales – what should we do about it? In the last few decades, Welsh food has changed out of all recognition, with highly successful branding of Welsh products being synonymous with quality. Examples include beef, lamb, fish, chocolate, wine, beer and honey but there are many more. Along with this has gone the revival of traditional foods such as laverbread, bara brith, and Welsh cakes, and many areas of Wales now have their own annual food festivals. All of this is good for tourism and exports. Furthermore the Welsh government has been interested in a sustainable food strategy for Wales since 2010 and the growth of organic farms and smallholdings in Wales has been encouraged. Unfortunately, all of these welcome trends do not help with escalating food poverty. The high rates of poverty in Wales can be seen from numerous reports issued during the past few years and published by the Welsh Government, the Joseph Rowntree Foundation, WISERD (Wales Institute of Social & Economic Research, Data & Methods); campaigning organisations like Oxfam Cymru, the Welsh Food Poverty Network, and Food Poverty Alliance Wales as well as national papers such as the Guardian and local papers including the Pembrokeshire Herald and the South Wales Evening Post. Basically food poverty is caused by low income: high rates of unemployment, very low pay and benefit cuts. In households with low income, food may not be prioritised as highly as rent, council tax and other bills, since failure to pay these can have grave consequences. Food is seen as an elastic part of the budget, with parents reporting that they skip meals so that children can eat and that they have to buy the cheapest food available, which is not necessarily the healthiest. But poverty is also caused by the high costs of housing, transport and food. In some areas locals, tourists and second home owners are in competition for accommodation, while poor public transport creates pressure to own a car, with its attendant costs. Furthermore, much of Wales exists in a ‘food desert’, particularly in the rural areas where it is difficult for many people to access shops, especially the supermarkets which usually carry a wider range of fresh foods. Small local shops are often very expensive and what fresh food they carry may not be very fresh because of the low turnover and the need to transport it over long distances. All of these tendencies are likely to be exacerbated by Brexit. Poverty in general usually leads to food poverty which is also a public health issue. There have been reports of high rates of malnutrition and morbidity, and a decline in longevity. As noted by Health in Wales, ‘Coronary Heart Disease (CHD) is a leading cause of death in the United Kingdom, and particularly in Wales, where the death rate is greater than in the majority of the countries in Western Europe’. Furthermore it is the poorest people who are most likely to suffer from obesity with levels higher across all ages in the more deprived areas (Welsh Health Survey 2013). The BBC recently reported that obesity is now overtaking smoking as the biggest risk to health in Wales and attributed this to the widespread availability of cheap junk food. Pembrokeshire is where my research on food poverty has focused over the last few years. The Bevan Foundation noted in 2018 that ‘Pembrokeshire has one of the highest risks of poverty among people of working age in the UK, resulting from a mix of low wages and high housing costs’. Pembrokeshire has a high number of incomers who are either permanent or temporary residents. There are retirees who can afford high housing costs, wealthier second home owners, and a big demand for holiday rentals. All of these push up the costs of accommodation, especially in tourist ‘hotspots’ such as Newport where houses have become unaffordable for local people. There is a large amount of ‘hidden poverty’, especially in rural areas, but it also exists in the small towns, including those in the south where former industries have disappeared. There is a high rate of unemployment in the county, while those who are in work often have to accept low wages (sometimes below the Minimum Wage), seasonal employment (especially in areas of tourism), and precarity (e.g. zero-hours contracts). The roll-out of Universal Credit in Pembrokeshire has further exacerbated poverty because of the long period between the ending of old benefits and the start of new ones, as well as the continuing of the punitive sanctions regime and the cuts in benefits more generally. But there is another dimension to food poverty in rural areas and small towns and that is the reluctance to disclose it. As I have heard many times ‘You don’t want to be seen as poor’, which is considered stigmatising. For several years Wales has had an unusually high prevalence of food banks and the number of both Trussell Trust and independent food banks has increased since that time. In Pembrokeshire for example, Trussell now has four food banks as does Patch, an independent charity. Both are run largely by volunteers and receive their supplies from donors. Wales is part of the globalised food marketing system, with supermarkets like Tesco, Morrisons, Sainsburys, Coop, Aldi and Lidl in the towns. Most of these cooperate with food banks to allow in-store collections of long-life food donated by customers. More recently, supermarkets have also been providing their surplus fresh food to charities, in some cases via the Food Cloud facilitated by the organisation Fareshare, in other cases with bilateral or unofficial arrangements between food outlet and food banks. The Food Cloud has meant that more fresh produce is available to food banks, but supplies are inevitably uncertain. How then is it possible to bring good quality fresh food to people who need it but cannot afford it, without having recourse to food banks which risks the clients suffering from the associated stigma? One promising development is Community Fridges, open to all. At present in Pembrokeshire for example, these exist in Narberth, Fishguard and Haverfordwest. Another is the setting up of regular community meals, available to everyone, not just the food poor. These emulate some of the policies being adopted in Scotland which emphasise the links between food and community thereby ensuring both sociality and dignity. But more such initiatives are needed. Pat Caplan is Emeritus Professor of Anthropology at Goldsmiths, University of London. Further information on her research and writing is available on her webpage https://www.gold.ac.uk/anthropology/staff/pat-caplan/ and she blogs on http://sites.gold.ac.uk/food-poverty/. Thanks: I am grateful to the clients and volunteers of the food aid organisations which facilitated my research. Image: Pat Caplan. Food Sense Wales is a part of Cardiff & Vale Health Charity (registered charity number 1056544). It was born out of the work of Food Cardiff, a multi-award winning cross sector food partnership and member of the Sustainable Food Cities network, which aims to make healthy, affordable and sustainable food a defining feature of the city. Food Sense Wales’ aim is to apply the knowledge, expertise and experience gained from Food Cardiff and stakeholders across the Welsh food chain, to help shape food policy that makes sense across the whole of the food system in Wales; to the economy, the nation’s health and the environment. Peas Please Programme Board (Joint initiative led by Food Foundation to increase veg consumption). There is a lack of strategic “join up” across the policy areas that link food. Welsh Government’s strategic direction with regards to food and wellbeing across the life-course is inadequate. Food Poverty is a growing concern and there is no cohesive policy for monitoring or addressing it. There is no established Wales wide network or organisation bringing the shared experience of the Food System together to help inform policy. Brexit is fraught with challenges but Wales has the opportunity to develop a unique brand. All submissions to the Consultation are now available to read here. The contemporary economic system has broken the vital relationship between Land, Food and People. There is a crucial need to renew the system that has produced this breakdown. Brexit represents a propitious historical moment to respond decisively to a range of critical issues relating to the disproportionate empowerment of corporations, landowners and shareholders—an empowerment that has come at the cost of our national health, the democratic concerns of systemic stakeholders and the legitimate expectations of land-workers, in particular. The figure below models and critiques the current economic system, using three overlapping circles, representing Land, Food, People and the crucial overlaps between them, of production, consumption and participation. The vast majority of UK land is owned by a tiny minority of the UK population. Wealthy landowners include: aristocratic families, the Anglican Church, the military, the government, utility companies and financial institutions. As a result, most agricultural land forms part of large estates, inevitably effecting how it is managed. Just 2% is built upon. Put simply, land ownership is undemocratic because the general population, even rural dwellers (and particularly land workers) have practically zero influence over how UK land is utilised—such as how to appropriately respond to the housing crisis. The UK population is increasingly urbanised, so that even those who live outside of towns are increasingly resourced by urban services (surgeries, hospitals, supermarkets, shops etc). It is also increasingly diseased: obesity, diabetes, heart disease, cancer etc. Our national health system is pharmaceutical-centric, yet drugs are generally unsuited to curing chronic disease, root causes of which lie in diet, lifestyle and environmental factors, leading to lifelong prescriptions: good for pharmaceutical corporations, bad for patients. The basic problem with the food we eat is nutritional. Many people, including (actually, particularly) obese people, are undernourished. Consuming a surplus of calories, yet lacking an adequate intake of healthy nutrients. Furthermore, there is endemic, damaging confusion about the pros and cons of carbohydrate and fat. “Time-poverty” has led to a perceived need for convenience, leading to the availability, promotion and use of processed foods and subsequent deterioration in the social value of food and food preparation as an integral element of family life. The relationship between food and people is dominated by supermarkets. Supermarkets, like all corporations, are driven by the need to create shareholder profits. When corporations calculate their profits, they typically ignore large, un-costed ecological consequences. Despite ubiquitous TV programming, fresh food preparation is an increasingly lost art in many homes, as well as hospitals, care-homes and schools. Currently, food production is based largely on an intensive, industrialised model, which relies upon exploiting ecological resources, in unsustainable ways, such as those that lead to soil nutrient erosion, widespread use of chemical pesticides, livestock welfare issues, flora, fauna diversity loss, ecological destruction, erosion, flooding etc. These economic patterns have also contributed to a general loss of social, economic, cultural diversity in rural regions. The link between land and people is essentially broken: a whole generation of young people lack understanding about food origins, whilst urbanised populations associate “countryside” primarily with recreational activities and believe that countryside issues should be left to farmers to resolve. As allotments have disappeared, the growing of vegetables—once a national pastime—is now considered “quaint” and irrelevant, despite our nationally importing about 40% of our food, raising important issues of “food sovereignty”. The figure below models some primary elements that need to be addressed if the current economic system is to be renewed in favour of creating one more appropriately weighted towards the holistic needs of the general population, systemic stakeholders (everyone holding a stake in any particular system) and land-workers, in particular. By focussing economic rewards on marginal, small and family farms, it becomes possible to move steadily towards environmentally-sustainable means of production, such as organic, biodynamic and permaculture. Local food production and distribution can go hand-in-hand with allowing more people to live on the land—as envisaged by Wales’ innovative—but currently under-utilised—One Planet Policy. A renaissance in freshly prepared, local, organic food, based around authentic nutritional knowledge and use of local food produce, will allow the relationship between food and people to be restored. Nutritious, (chemical) pesticide-free and organic food will contribute to better health amongst populations that partake—of special relevance to schools, care-homes and hospitals. As people become increasingly ecologically aware, the possibility exists to integrate rural and urban living more holistically than before. Innovative expression such as Food Assemblies—now over 900 existing around Europe—such as the one I am involved in pioneering in Llanelli, and Community Supported Agriculture schemes, such as Banc Organics, established in the marginal land of the Gwendraeth Valley, herald unique opportunities for participation, including volunteering, education and potentially significantly higher employment rates per hectare, compared to intensive farming. In comparing two economic models, I’ve highlighted a series of critical issues relating to the contemporary system in relation to land, food and people. The first model illustrates how the current system “distributes” wealth to shareholders and landowners. It is my contention that the current state of the UK economy and health of the population-at-large confirms that in this scenario, there are few winners and many losers. The second model illustrates the potential for reimagining and “redistributing” economic empowerment to stakeholders and land-workers. A scenario, I would contend, with the potential to create many winners, few losers. Getting there will require not only innovative thinking—thankfully, there is much of it about—but more importantly, a great deal of determined, pioneering action, coupled with political liberation from the shackles of the contemporary system—if there is to be any hope of significant change. Common Wealth—For a free, equal, mutual and sustainable society, 2010, Hawthorn Press, Stroud. Blessed Unrest—How the Largest Movement in the World Came into Being and Why No One Saw It Coming, 2007, Penguin Group, New York. Doughnut Economics—Seven Ways to Think Like a 21st Century Economist, 2017, Random House, London. John Clements is based in Llanelli and writes at https://jbclements.wordpress.com. The way we produce, process, distribute, consume and waste our food has obvious and significant implications for the enjoyment of a wide range of interdependent civil and political, and economic, social and cultural human rights. Reliable access to adequate, nutritious and culturally acceptable food is, after all, a pre-requisite for a healthy, productive and contented life. Whether one focuses on the most basic of human entitlements – the right to life – or upon other rights such as health, education, work, private and family life, or freedom of religion, it is easy to see the interconnections between food governance and effective human rights protections. Thus, it is perhaps rather unsurprising that from its inception, international human rights law has recognised and explicitly accommodated a fundamental human right to food. In Article 25 of the highly influential but non-binding Universal Declaration of Human Rights 1948 it was expressed as one of the key elements of a broader umbrella right to an ‘adequate standard of living.’ Almost three decades later, with the entry into force of the legally binding International Covenant on Economic, Social and Cultural Rights in January 1976, the legal credibility and status of the this most crucial of human rights was confirmed. From my perspective, as an academic lawyer with an interest in human rights, it is clear that what the text of the draft Food Manifesto for Wales provides is, to all intents and purposes, a description of a human rights compliant food system. 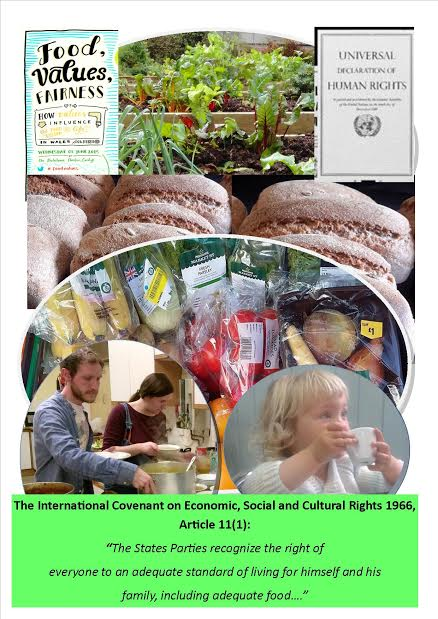 The Manifesto’s vision of an equitable and sustainable ‘food future’ for Wales is informed by a concern for the very same shared human values that led to the emergence of international human rights law. As I see it, the text of this ‘food charter’ effectively translates the broad fundamental values of ‘universalism’ and ‘benevolence’ – the values that are the foundation of the International Bill of Rights – into ten key benchmarks of a legitimate and socially just food system. Moreover, the detail of the Manifesto’s goals resonates very closely with the detail of legal substance of the human right to ‘adequate food’ as it has been interpreted over time. Thus, both international human rights law and the Manifesto are concerned with achieving something rather more holistic than basic population-wide nutritional adequacy. The vision set out in the Manifesto, and the legal right entrenched in international law, both envision a ‘food future’ underpinned by justice and respect. This is a food future where all people, at all times, are able to enjoy equal access to nutritionally adequate, culturally acceptable, affordable food that has been produced, processed and distributed in a manner that respects and protects the environment, the dignity and rights of all people, and the welfare of livestock and wildlife. I believe that the Manifesto, with its emphasis on sustainability and social justice, will speak to the full range of stakeholders across the whole of the supply chain – consumers, farmers, industry and government. After all, whatever else we might be, we are all human beings whose lives and beliefs are shaped and informed by shared core human values and whose wellbeing and survival is dependent upon the preservation of a genuinely sustainable and socially just food system. On a practical level, by highlighting and reinforcing these shared values, and by inviting stakeholders to publicly sign up to its ten key goals, the Manifesto may help to soften tensions and bridge differences between the various stakeholder groups who inhabit the food landscape. Moreover, if a high enough public profile can be achieved, and if the language of ‘values’ and ‘human rights’ is effectively and tactfully exploited, the Manifesto may also provide leverage to encourage the compliance of key actors (governments and industry) with their existing obligations under international human rights law – and in particular, in relation to the human right to adequate food. An overview of the International Bill of Rights can be found at https://www.escr-net.org/resources/international-bill-human-rights. The UN Office of the High Commissioner for Human Rights has published an accessible and informative booklet on the human right to adequate food – Fact Sheet No.34: The Human Right to Food. This booklet can be accessed at http://www.ohchr.org/Documents/Publications/FactSheet34en.pdf See also, the Food and Agriculture Organisation of the United Nations (UN FAO) website at http://www.fao.org/righttofood/right-to-food-home/en/ , and the webpages of the UN’s Special Rapporteur on the right to Food at http://www.ohchr.org/EN/Issues/Food/Pages/FoodIndex.aspx. Dr Naomi Salmon is an academic lawyer, micro-baker and food activist with a passion for social justice, community, sustainability and human rights. 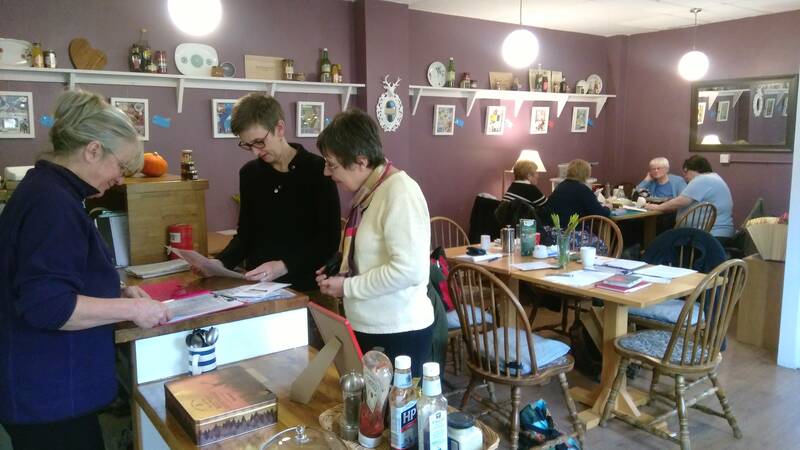 The cafe has also been supported by the Wales Cooperative Centre, who funded a business plan, and itwon the 2014 Sustainable Communities competition at the Hay Festival which provided a grant. Takings have grown and it is becoming more financially viable, but it still needs grants to cover some of its running and labour costs, including some part-time kitchen staff who provide continuity for the volunteers who assist with food preparation, record keeping and service at the counter. I wouldn’t describe myself as a food expert or an environmentalist. But I am worried that our food system is making us ill, that it’s harming nature, and that the most vulnerable people in society are the worst affected. I’m troubled by the increase in diet-related illnesses (NHS data analysed by Diabetes UK reveals that diabetes had increased by almost 60% in the decade since 2005) and the increase in malnourishment, often going hand-in-hand with obesity. I think it’s scandalous that people living in the UK—the 4th richest country in the world—are going hungry while food goes to waste. (The UK is the biggest producer of waste in the EU, throwing away over 14 million tonnes per year). And I’m concerned that the way we’re producing food is compromising the earth’s capacity to provide us with food in the future. The truth is that a lot of the food we eat is unhealthy, damaging to the environment, cruel to animals, and unfair to workers it depends on. It’s wasteful and unsustainable. We need to change the way our food system works. We’re beginning by gathering opinions and experiences from people across Welsh society—academics, businesses and community groups—and we are identifying a list of practicable actions that government can take to support social, economic and environmental equity, through food. We’re writing a food manifesto for Wales. By ‘we’ I mean a small but growing network of people who think sustainable food is important, and are contributing the time and skills needed to get the food manifesto idea off the ground. The manifesto isn’t funded and isn’t owned by any particular person or organisation. That’s intentional – we want the manifesto to be developed collaboratively, with people working across society. What should the Food Manifesto contain? The proposals in Professor Kevin Morgan’s recently published paper, Good Food For All provide an excellent place to start. The paper emphasises the importance of expertise in sustainable public procurement. It identifies the importance of the public purse in delivering value in its broadest sense—i.e. community benefit, training, jobs and other sustainability goals. And it recognises the importance of making ‘good food’ highly visible in the public sector by demonstrating commitment through a credible and recognised catering mark like Food For Life. What should be included in a food manifesto doesn’t sound much like a dinner table discussion. It’s unlikely that deliberations about food systems, sustainability and ethics often seem relevant to everyday life—not when you’re trying to get dinner on the table for a hungry family—but it’s still vital that the significance of food at a family, neighbourhood and community level is addressed in any food manifesto that is written. It’s vital because what matters to people – what people value – drives change. There is substantial research from social psychology and other disciplines, which explains how values work. Values shape our identity and our society. Values influence what we do and how we feel. They connect people and issues. (If you’re interested in finding out more it’s worth looking up Common Cause). Earlier this year I did a social research project, talking to people living in some of Wales’ least affluent communities about what food means to them. It means family. It means comfort. It’s a celebration. It’s an important part of culture. It’s about sharing with friends and neighbours. It’s about trust, fairness and friendship; it means home. It means nurturing and nourishing the people you love. It means the same things to them as it does to me, but we don’t often have these conversations about food or connect to that deeper meaning—the things we really value. Food isn’t just a commodity. It brings families, friends and communities together. It connects us with the nature. It provides comfort and security. It builds skills, confidence and feelings of self worth. It increases resilience. These things make people thrive. Food unites us. It’s a conversation everyone can take part in, and talking about food is how we can make sustainable development meaningful and relevant across society. By finding common ground and shared values we can build a collective commitment to creating a fair food system. This is what the Food Manifesto is all about.